Alcoholics Anonymous, celebrating its 75th anniversary this month in the midst of the Great Recession, has been in existence since the Great Depression. Prohibition had ended two years prior to its founding in 1935, and alcohol still carried a strong stigma of immorality. Treatment options for alcoholics were severe. Co-founder William Griffith Wilson reportedly underwent a "purge and puke" treatment  in which a patient was given toxic salts or plants to expel his demon  shortly before creating a program based on a much milder solution: abstaining from taking in the bad stuff to begin with. 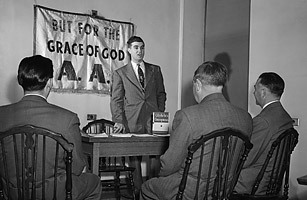 By 1939, AA had expanded to three groups that produced 100 sober members, and publicity of its success brought it a deluge of new people seeking help. By the end of 1940, there were 2,000 members, 6,000 by the time Japan bombed Pearl Harbor in 1941. By 1950, that number had jumped to 100,000. Meanwhile, the organization's leaders worked out the program's kinks, eventually arriving at the famed 12-step method, which would continue to spread around the world as a way for alcoholics to find hope by recognizing their helplessness.